Our mill makes this fabric to match the fabric from De Witte Engel, but much less expensive and made in the USA. 100% cotton interlock knit fabric for doll skin, made in the USA. Our heaviest weight for doll making: approx. 14.5 oz/yd. 60" (153cm) width for best value. Optional: 30" width cuts - half yard is enough for one doll. NOTE: 30" width cuts will come as individual cuts, but multiple yards of 60" will come in one, continuous length. 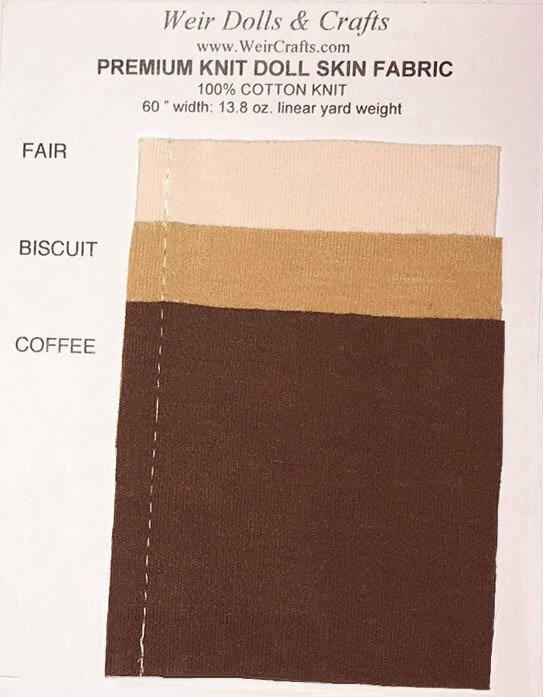 Color swatch card with 2x2" swatches of heavyweight knit doll skin colors.